Here are 51 easy-to-use, classroom-tested alternatives to the "stand-and-deliver" teaching techniques that cause so many students to tune out or drop out. Teachers report that these techniques motivate students to participate in learning, as they build confidence and are supported by compelling and safe ways to demonstrate their knowledge and understanding of lessons. Refined through years of classroom experiences and supported by updated research, this 2nd edition delivers a dozen new techniques to engage K–12 students in active learning. 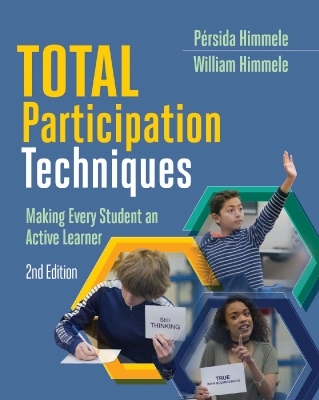 The authors provide detailed descriptions of the Total Participation Techniques (TPTs) with step-by-step instructions—plus reproducible blackline masters for student response cards as well as posters to remind you to use the techniques. They also suggest how you can adapt and personalize the techniques to fit your context and content. Packed with examples from authentic classrooms, Total Participation Techniques is an essential toolkit for teachers who want to present lessons that are relevant, engaging, and cognitively challenging. In this clip, Pérsida Himmele explains an instructional technique called the Ripple. Pérsida Himmele has served as an elementary and middle school teacher, a district administrator, an English language learner program consultant, and a public speaker on issues related to student engagement and teaching in diverse classrooms. William Himmele has served as an ESL teacher and a Speech Pathologist, a higher education administrator, an international consultant and a speaker on issues related to increasing student engagement and teaching English language learners.